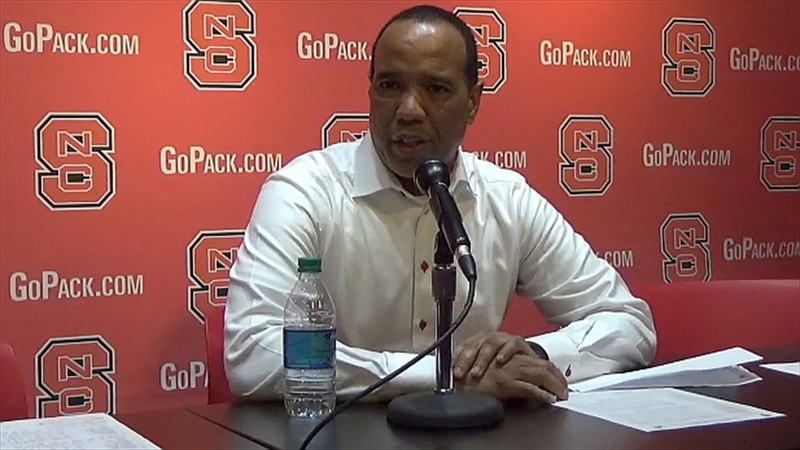 Keatts: "It Was A Great Night"
NC State head coach Kevin Keatts met with the media after the Wolfpack's 100-67 win over Western Carolina. What an honor to have Pam Valvano and her daughters here for the special dedication for Jimmy Valvano. It was a great night and I’m glad that we could be apart of it. I know you know so much about him in basketball. Sometime today they were playing his speech, and everytime his speech comes on, I can’t turn it off. I have to listen to it. I’ve probably listened to it 2,000 times. It’s probably one of the best speeches I’ve ever heard and the reason being is, during his times of struggle, all he could think about was helping someone else. As a basketball coach, you know we love to win. Yet we have to ask ourselves this: when you’re gone and no longer on Earth, how do people look at you? When you think about what he did, what he said, and how’s he helped raise so much money even though he’s not here anymore, you know that says so much about him as a man and as a person. I’m just proud to be here and honored to be a part of it. I don’t have a number for that for the game, but I know we had 18 at the half. That gave me a chance to yell at them because we’re supposed to have 20 per half. I know we turned them over 21 times in the second half, so I was happy with that. We had 33 for the game, so I would say we got over our 40 deflections. I love my team. I told you guys in the beginning of the year that what stands out about this team is its versatility. I just told those guys in the locker room that on any given night, if we stay together and we fight together, anybody could lead us in scoring, and we could be a very good basketball team. I thought Blake Harris played great, I thought Jericole Hellems was good with his first career-high, and I thought Devon Daniels was very good tonight. I told them to embrace the moment. This is my second chance to play in this electric building. What a great place. Adding on the fact that there was the dedication to Jimmy Valvano, and it was unbelievable. I just told them to embrace the moment. I thought he had a couple good days of practice. You guys hear me say this all the time: I feel you play the way you practice. I thought he was locked in. It’s funny as a coach, and I told my assistant coaches today that he would have a great game in here. I’m going to petition this year that we can have our ACC games in Reynolds. Blake’s a good player. It’s tough when you come into a program and you’re a transfer, trying to figure out how you fit in. That’s what has happened to Blake so far, and I think now he understands what his role is. The same thing has happened with all of our guys. Since we have so many new pieces, one-by-one you’ll see guys starting to play a little bit better because they’re starting to get comfortable with the system. He showed me where to get them, and I went online. They’re Gucci wolves heads, and they just happened to match up great with NC State. As you guys know, I am a shoe guy. I had to have them, and I thought this was a special moment to pull them out. So no Adidas-- I’ll give Takayo a shoutout for the shoes. He’ll love that too because he would never think I would give him credit for that. I love Jericole. As we continue to build the program, we need freshman like Jericole to play well and build the program, especially with a lot of transfers. I’ve said this a lot of times before: if I can get more freshman to help build the program for the future, that’s great. He’s going to be good. His role right now, in his mind, is to come in and score. I want him to come in and play great defense and pass the ball, and then score. He’s going to be a good basketball player for us.